BTR-Plating Resources provides high-quality and competitively priced decorative nickel-chrome and industrial hard chrome plating services with the emphasis on quality, service and fast turn-around. Chrome Plating often referred to simply as Chrome is a technique of electroplating a thin layer of chromium onto aluminum, copper, steel and stainless steel parts. Chrome plating is a finishing treatment utilizing the electrolytic deposition of chromium. 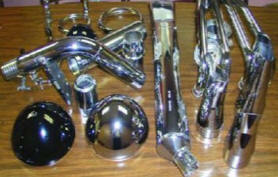 The most common forms of chrome plating are decorative bright nickle-chrome and industrial hard chrome. Decorative Nickle-Chrome plating requires one or two layers of copper and/or nickel plating prior to the deposition of chrome which provides surface embellishment as well as corrosion resistance and increased surface hardness. It imparts a mirror-like	finish to items such as metal furniture frames and	automotive trim. Decorative Chrome Plating is applied to so many different types of articles that the brilliant bluish appearance of the metal is familiar to everyone. The deposit does not tarnish and requires only occasional washing with soap or water or wiping with a soft cloth to remove any accumulation of dust and dirt from the surface. 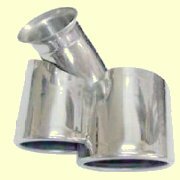 Machine parts that have become worn can be repaired using hard chrome. Parts can be restored to their original dimensions. This usually requires grinding before and after the plating process. Hard chrome plating on the wear surfaces of new machine parts will protect against abrasion and wear and increase the life of the part. Hard chrome provides excellent corrosion protection on many different substrates in different environments. Hard chrome provides excellent abrasion resistance because it has a low coefficient of friction. It lasts 50 to 100 times longer than hardened steel or electroless nickel plated parts. Hard chrome can be buffed and/or polished to a brilliant high-polish or satin finish, enhancing the appearance of parts. We firmly believe that keeping our environment GREEN is everyone's responsibility so we insure that our facilities are RoHS compliant. This means all products must conform to strict standards, provide extensive compliance, documentation and ensure that electrical and electronic products sold do not contain lead, cadmium, mercury, hexavalent chromium, or polybrominated biphenyls.